In December of last year, DestinSharks.com announced a beta test of full featured nautical charts for Google Earth. They have now announced availability of EarthNC Plus - a single CD with 677 nautical charts covering the entire US regions based on the NOAA dataset. The US National Oceanic and Atmospheric Administration (NOAA) releases their nautical charts in electronic form for free. The trick is in processing the data and making it available in a navigation program. 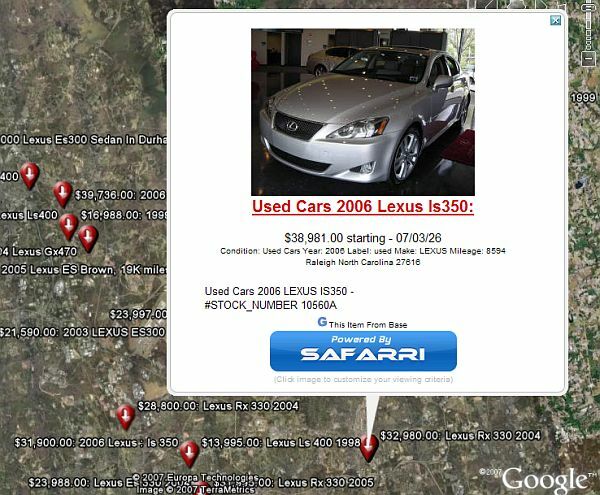 EarthNC Plus charts utilize features built in to Google Earth to provide the type of effectiveness you would expect from a full-featured navigation system. For example, the charts pull in more information as you zoom in closer (depth soundings, buoy markers, underwater features, etc.). The depth markings are in full color and EarthNC takes full advantage of the rich placemarking capability of GE. EarthNC Plus is even better in some ways than most navigation systems because Google Earth is a full featured 3D virtual globe. Especially when you consider the primary navigation software, Google Earth, is free. In some waters you won't have an inexpensive broadband Internet connection. So, you will want to cache the imagery for the places you plan to visit - but, otherwise Google Earth works pretty well without the connection. You can also use tools to hook up your GPS and have Google Earth provide you with chart plotting capability. I plan to use EarthNC when I sail in the Virgin Islands for a week this summer (yes the coverage area includes Puerto Rico and the Virgin Islands). According to DestinSharks: "Charts are derived from NOAA ENC and Army Corps IENC digital vector charts with significant enhancements for use with Google Earth’s powerful 3D mapping engine. EarthNC Plus is being offered at an introductory price of $49.95 which includes a 12 month chart update subscription." If you've been a boater for very long, you can appreciate the value of full nautical charts for the entire US region for this kind of price. For more information, go to EarthNC.com. The recent update to the imagery for Google Earth has caused a bit of an uproar. According to the GEC and my sources at Google, the imagery for New Orleans was actually changed last September. The previous imagery was directly after the storm struck, and was of inferior quality. Although the imagery of New Orleans is from pre-Katrina now, it is of better quality. If you have the Plus or Pro version of Google Earth you have the option to load two sets of post-Katrina imagery by logging out of the primary database. I think Google should consider getting more recent high quality imagery for New Orleans so it at least represents the present condition. Apparently, Google selected a new set of high resolution photos for New Orleans. The only problem is that the new images are pre-Hurricane Katrina. So, all the damage that was caused by Katrina has now been erased in the Google Earth/Maps imagery database. CBS News says this move has sparked outrage and conspiracy theories in New Orleans. 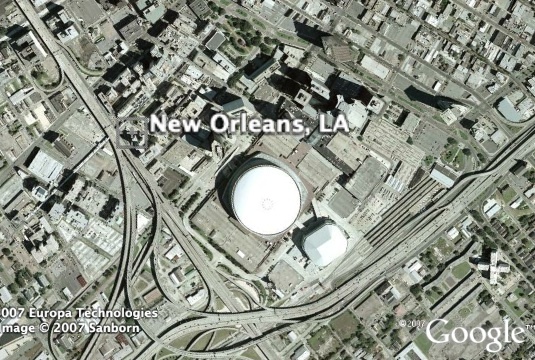 Ironically, the people in New Orleans have been some of the biggest fans of Google Earth as it helped save lives during and after the disaster. And, up until the recent update, residents used the pictures to illustrate damage to insurance adjusters, and to plan reconstruction efforts. Some of the conspiracies are that the local government itself requested the change to try and encourage tourism to come back to New Orleans. In my opinion, Google should probably have considered the implications of such a change before releasing it in this fashion. Google could easily offer a layer which allows the new or old imagery to be shown. Perhaps this would be a good compromise. Surely, Google still has a copy of the old imagery. Actually, many GE enthusiasts have suggested it would be nice if Google offered a time selection capability on imagery so you could watch the evolution of a place over time from aerial photography. Amsterdam Google GeoDay - The Google Netherlands office decided to hold a Google GeoDay (for developers) during Amsterdam’s EXPO XXI yesterday. Twan Eikelenboom does an excellent job of describing the event on his blog. Twan received an invitation to the event in the form of a Google Maps placemark. Nice touch Google. There was a keynote from Bernard Seefeld (formerly with Endoxon which was acquired by Google). Also, Brandon Badger gave a talk about KML and Google Maps API. Remco Kouwenhoven (http://nederkaart.nl) showed some examples of Dutch Google Maps mashups. Google had several workshops and here are a couple of web pages which supported the works shops on Google Earth and Maps. About 400 people attended the event apparently. Thanks to Remco for making me aware of the event. Hopefully Google will be doing a Google Geo Developer Day again in San Jose during the week of Where 2.0 (although no official word yet). GoogleLit Trips - The Google Lit Trips site provides educational Google Earth collections which document the geographical information associated with famous literature. I found this on the Google for Educators page for GE. US Capitol - I was noticing Google now has a nice US Capitol building in 3D inside Google Earth. You can see it by flying to Washington DC , and turning on the "3D Buildings" layer. The model was done by a "jw_n_mo" who apparently did it while snowed in one weekend. It was posted to the 3DWarehouse. 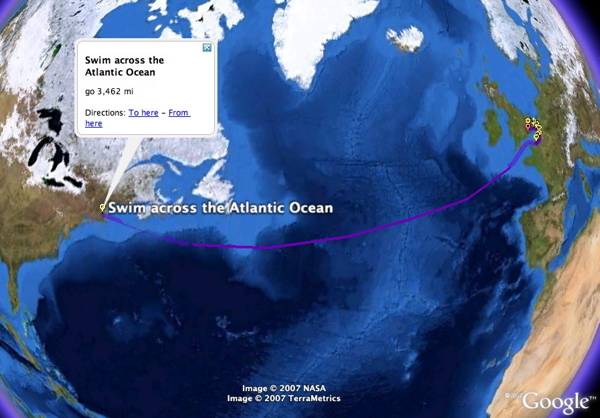 Directions from Google: "Swim across the Atlantic Ocean"
This is very amusing! If you ask Google Earth or Google Maps for directions which require you to go across an ocean, then Google will give you those directions. For example, if you ask for directions from Boston, MA to London, UK (see step 9) it gives you driving directions to the coast and then will tell you to "Swim Across the Atlantic Ocean". 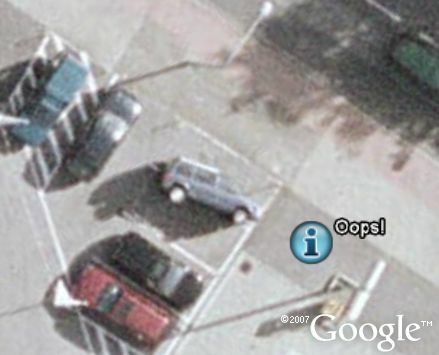 Here's the same thing in Google Earth . Caution: following these directions may be hazardous to your health! Note: this cross-ocean-direction thing only works with a limited number of cases for the places I tested. If you come up with other directions that work (especially other oceans), let me know by leaving a comment here. It does seem to work for other Atlantic journeys like "san diego, ca to berlin, germany" (at least with Google Maps, GE won't find that path). Also, there appears to be a bug with the directions path in GE (the path isn't set to stay above sea level - that would make sense if you tried to drive). This tip came from Philipp Lenssen of Google Blogoscoped. Google released new imagery last night. I'm sure a few folks in the UK will be happy to see some new imagery finally. Too bad about the photoshopped planes being taken out. Note: the new high res photos introduced for Sydney after Australia Day have been cleaned up. The waters in the Sydney Harbour in particular were made to look much cleaner, but the high res photos of the boats and the helicopter are still there. Rumor mill: Did Google Buy Vutool for Street-Level Photos? Quite a bit of stir in the rumor mill today thanks to a blog post by TechCrunch (TC) which speculates that Google purchased a startup called Vutool. According to the description at TC, it sounds like the company had developed technology for capturing street level imagery at all angles and other "intellectual property" for processing and displaying this information. Microsoft a year ago released a technology preview (still working) of something like this for Windows Live Local which provides an interface allowing you to "drive" a car and look in different directions at streets in Seattle. 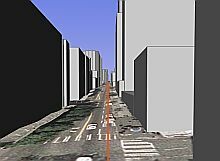 Google Earth Blog demonstrated how you could do something similar in Google Earth by "driving" down 3D streets for cities with 3D buildings in Google Earth. But, it lacks the street-level photographs except for those integrated on 3D buildings with textures. However, a technology like what Vutool has described could be an awfully nice way to get photos for 3D building models... Hmmmmm. Microsoft already has access to technology which uses photography to rapidly grow its collection of 3D buildings with textures. Microsoft has invested tens of millions of dollars in the technology and hiring aerial photographers to take these "bird's eye" views of buildings in cities. Vutools technology might actually help Google develop similar, or maybe even better, capabilities. So, maybe the rumors that Google bought them have some credibility. Thanks to Matt for being the first of several to contact me about this. This is an interesting twist. Instead of making Google Earth into Second Life, why not make a virtual version of Google Earth inside of Second Life? Second Life is an alternative 3D universe (or Metaverse) which lets you have an alternate version of yourself and explore a different 3D world. Josh Knauer has developed a virtual version of a Google Earth like interface which he calls GeoGlobe. He announced GeoGlobe on his blog here. You need to have Second Life installed, and then follow this special link to teleport yourself into Second Life to let you view content such as Google Earth's KML placemarks or GeoRSS. It would be neat if someone at Google considered doing Virtual Google Earth for Second Life as a real application. The neat part would be shrinking down your Avatar and putting it on top of the GE terrain and walking around. Then, you could zoom into a 3D house and log onto someone's computer and use Google Earth inside the Virtual Google Earth inside Second Life.... Ok, this is getting crazy. :-) Picked up on GeoGlobe via OgleEarth. If your business has already made an investment in marketing via its building signage, you could reap some unexpected marketing rewards thanks to Google Earth. When someone takes the trouble of modeling your building in 3D, you want to make sure they also implement a phototexture of your signage. The example seen here is of a Ross clothing store and a Best Buy near Denver, Colorado. 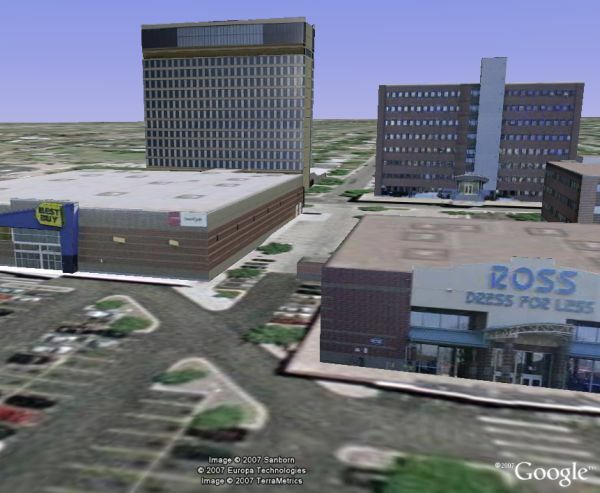 You can see these buildings with Google Earth 4 by turning on the "3D Buildings" layer. These buildings are in the Google 3DWarehouse so they got picked up and put in the layer. The National Science Foundation is soliciting entries for its Science and Engineering Visualization Challenge. The Journal Science is also involved with organizing and selecting the winners of the Challenge. The intent is to highlight the best use of visual presentations to highlight science and engineering projects or concepts. "The winners will be published in a special section of the Sept. 28, 2007 issue of the journal Science and Science Online and on the NSF Web site. " Google Earth enables some pretty impressive scientific visualizations. See just a sample from the GEB science category. I hope scientists using Google Earth for visualizations will consider entering the contest. Got a big laugh this morning out of this blog entry by Gary Turner of the UK. He muses about yet another way Google Earth is changing the way people think. And so, I caught myself thinking over the weekend while attempting to find a reputable landscape gardener to come along to quote for finishing off our garden, which has lain for two months in a rather dishevelled state after our builder did some re-modelling, that we’d better hurry up and get it finished and tarted up all nicely before a satellite flies overhead and takes another photograph for Google Earth. So, if you have a mess in your back yard - you have a new incentive to clean it up. After all, a photo of your yard may get taken by a satellite or aerial photographer and end up in Google Earth for the next five years! The photo (which you can see in Google Earth here .) 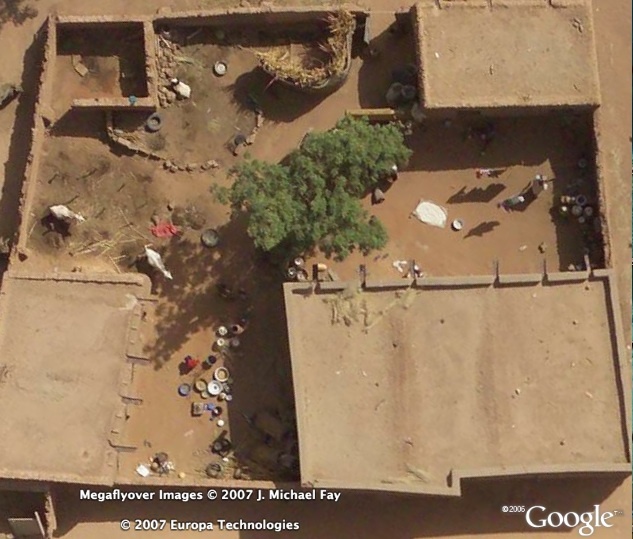 is of a house in Niger, Africa. Google has improved how it categorizes and links to the screenshot (and other) images found on my blog in Google Images. It now both shows a snippet of text (which unfortunately is not always related to the image or article), and it properly links to the appropriate blog entry tied to that image. In the past, it would often link to the monthly page, or the home page itself for all the images (which was wrong, and not helpful). But, now you can visually browse the gallery of screenshots (several hundred of them), to find interesting stories about Google Earth from Google Earth Blog. I think this could be really useful if you just want to browse and find something interesting about Google Earth. 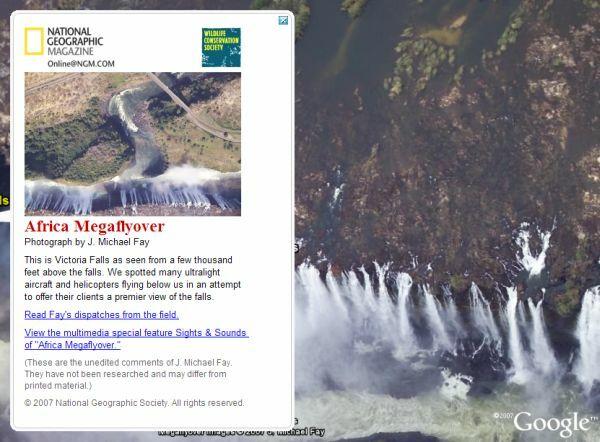 Try out the Google Earth Blog Gallery of images courtesy of Google Images. The Victoria Falls have to be one of the most awesome spectacles on the Earth. Fortunately, Michael Fay of National Geographic didn't fail to take some pictures while he was flying all over the continent of Africa for the Africa Megaflyover collection. His photos are mapped into Google Earth at the location of the falls, which you can see here . The Victoria Falls are located on the border between Zambia and Zimbabwe. The Victoria Falls witness hundreds of thousands of gallons of water per second falling along a 2 km long gorge. The water makes its way from 8 different countries and eventually ends up in the Indian Ocean. According to Michael Fay's notes he saw lots of ultralights and helicopters below him trying to give tourists the ultimate view of the falls. If you turn on the "Geographic Web" layer while looking at the falls, you will see lots of blue circular placemark icons. These link to photos from the photo mapping site called Panoramio. There are many very pretty pictures of the Victoria Falls in these placemarks which come from people who have been there from all over the world. Panoramio makes it easy (and free) to upload your photos and put them on the map. After a month or so, your mapped photos show up in the Geographic Web layer for everyone to see in Google Earth. Read more on the Megaflyover collection. Not So Green - The Not So Green web site highlights real life photos (from Flickr) taken out the window of mostly commercial flights, and then compares the photo to a screenshot of the same view inside Google Earth. The focus is mostly on Greenland, but they also have done photos of other places. They also provide a link to view the photo comparison within GE. Here is an example of several photo comparisons. Reminds me of the Earth From Above collection. Whale Spotting - GoogleSightseeing has an amusing article describing attempts to find whales in Google Earth. It highlights several interesting places with evidence of whales. You can view the whales they found here , but it would be best to read the article while viewing each placemark. Frank Lloyd Wright - Found at the Google 3DWarehouse, a Frank Lloyd Wright designed house placed in Google Earth. "The Robie House was designed by Frank Lloyd Wright for his client Fredrick C. Robie. This building was designed in 1908 with construction finishing in 1910, and is one of the best known early examples of Prairie style architecture. The Robie House is well known for its dramatic overhanging roofs, its unique windows, and open floor plans. Model by Austin Metzger." via DigitalUrban. Well, this is mostly a Google Maps story, but important nonetheless. It's also more geared to developers than users. Google has added support in Google Maps for another standard file format called GeoRSS (Geographically Encoded Objects for RSS). This means, in addition to KML, that bloggers and other web sites can output an RSS file with location information and that file can be read into Google Maps and displayed. Many developers were asking Google to support this at the Where 2.0 conference last year. GeoRSS is a much simpler format than KML (so it has less capability), but it has less intanglements (i.e. Microsoft is supporting it, but has done nothing with KML yet). The Google Maps API blog also says the API itself supports both KML and GeoRSS. This means applications can be much sleeker and just make a program call to the procedure to load a KML and get instant geo information. There are examples in the blog entry. However, there are limitations. The KML Google Maps can handle is still limited. It can handle image overlays, polygons, lines, and placemarks. But, only of limited size. Hundreds of placemarks will throw it off. Or large size KML files. Also, network links are not supported. But, Google has been gradually releasing more support, so hopefully these limitations will get fixed in the future. Google Earth itself is probably the easiest application to create many KML files. And, there are already millions of KML files out there to sample (of which most are small enough to be loaded into Google Maps). A mountain name which appeared in the "Geographic Features" layer of Google Earth caused some negative publicity a couple of weeks ago. I just got an E-mail from this blogger (in Spanish) that Google has removed the label from Google Earth. 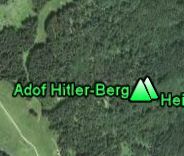 The mountain was re-named temporarily during the Nazi-era to "Adolf Hitler Berg", and somehow that label found it into a database which was showing up in Google Earth. After some residents in the area discovered the label it got publicized by a Speigel Online article (in German). Google quickly responded they would fix the label. Now, the label just shows the current name of the mountain "Heigel-Kopf". See previous story. The popular photo mapping and storage site Panoramio has very quickly reached 1 million photos in their database. Mostly thanks to being included as a default layer in Google Earth under the Geographic Web layer last October (see the graph in their blog post). 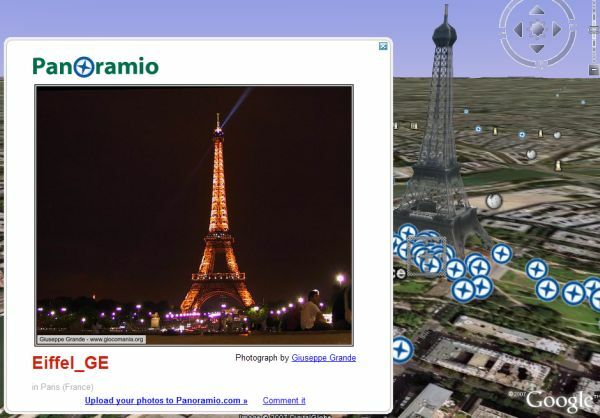 Panoramio can be used with our without Google Earth. Currently there are over 400,000 photos in the Google Earth layer - Google updates the new layer with the photo database from Panoramio once a month. This means nearly 600,000 photos were added in the last month! Related: Earlier article on Panoramio at GEB. SpaceNavigator SDK - 3DConnexion, which makes 3D navigation devices, has released a Software Developer Kit (SDK) so developers can write interfaces for devices like the SpaceNavigator for their 3D applications. The Windows version is available now, and the Mac version will be available March 30. I sure hope this means the support for the Mac version of Google Earth will be out soon. Twittervision - There has been some buzz about a cool Google Maps mashup which lets you view Twitter messages dynamically on a map. Twitter is a popular new social networking site which lets people send short messages about what they are doing at the moment. Other people can subscribe to watch messages from their friends. Or, you can just watch messages from whoever. It's become quite popular. Anyway, the TwitterVision application is pretty cool. I've been trying to contact the author, DaveTroy, to tell him his application should be easy to make work in Google Earth and could be made even more interesting. via GoogleMapsMania. Also, see San Francisco Chronicle article (17 Mar, 2007) about Twitter. Lodz, Poland - An aerial photography company will be taking new aerial photos for Lodz, Poland starting March 26 or 27. They contacted me to help spread the word in case people want to set up messages for the sky. GIS engineer (who is from Italy) Antonio Vinci let me know they have released some sample photos of Lodz and some 3D buildings for Google Earth. You can either watch the video or download the files (a little large since they contain the imagery) at this web site. There are currently no plans to get the new photography to Google Earth, but I suggested they try since Lodz is currently very low resolution. The photo shoot is being done for highway planning purposes. A member of the Google Earth Community name 'barnabu', who has contributed several innovative 3D models for Google Earth, produced a very cool version of the London Eye ferris wheel. This 3D London Eye can actually rotate in Google Earth by using the time animation feature - adding the 4th dimension. Download the London Eye here . After it loads, look for the time slider in the upper right of the GE screen and select the Play button (a triangular right arrow - or look at the screenshot instructions in his post). GE first has to load the animated versions of the models, so it will be slow the first time through. You can adjust the speed of the animation by clicking the little clock icon on the left side of the slider, and changing "Animation speed". 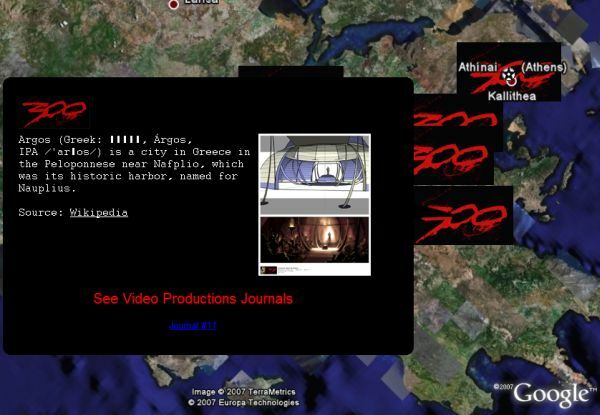 Warner Brothers has released a Google Earth file providing background information on the new movie 300 (based on Frank Miller's graphic novel about the Battle of Thermopylae in 480 B.C). I guess this is an attempt to do some marketing using Google Earth, but this isn't a very sophisticated use of Google Earth. There are a few placemarks showing some of the locations of the shooting. The placemark descriptions either contain some links to video journals showing how the movie was made, or in the case of the ones in Greece some background information which was mostly just taken from Wikipedia. Of course, you have to view the movies in a web browser. A Google Maps Mashup would probably have been better. They have released a Google gadget so you can find the nearest movie location on the same page above. Again, a Google Maps mashup on the page would have been easier. If you like the movie, you might want to check out the file here anyway. It will give you an opportunity to see these video clips which they probably will include on the DVD when it comes out. Fixes for Windows Vista - A new version of Google Earth is available for Windows - V4.0.2742. This release is primarily to address some issues with Windows Vista. No new version for the Mac. And, no new features. Airshows - I missed this post at the Google Earth Community by Google and Big Moving Pictures (which makes the big jumbotron TV screens seen at sporting events and airshows). They announced the availability of a Google Earth calendar of placemarks showing the locations of North American Military Airshows for 2007 . There are two versions of the placemarks available in the file, one which lets you use the time slider to show the movement of the shows over the course of the year. 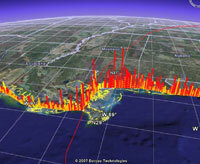 FBOWeb update - FBOWeb has updated their very cool Google Earth 3D flight tracking utilities. See the demo page here. In addition to being able to track all inbound flights to 8 major airports in the US, track a specific flight, and you can also see special 3D tracks and other information for recent aircraft incidents (crashes, near crashes, etc.). For more information on the flight tracking, read this previous blog post. This is cool stuff, if you haven't seen it, check it out. Photos with Search - Google released a new feature for searches with Google Maps about two weeks ago. When you search for businesses, you can now get related photos. For example, if you search for "Computer History Museum, Mountain View, CA" you not only get the address, phone number, and web site, but also a photo. Click on "More Info" and you get tabs of information including 16 photos, 2 reviews and hundreds of web pages. My hope is that Google will implement the same capabilities in a future update to Google Earth so the information is consistent on both platforms. via Blogoscoped. Those of you who are regular users of Google Earth have probably already discovered the super high resolution photos in Africa courtesy of National Geographic Magazine. What you may not know is that there are more pictures in Google Earth than originally thought (see below). The Megaflyover images were taken by NG photographer Michael Fay (who recently did the March issue article on elephant poaching) from a small plane at low altitudes using special aerial photography cameras. In many places you can see people looking up at the plane, and in others you can see villages, and many examples of African animals. Michael took over 92,000 photos. Several hundred of the photos are in Google Earth. By the way, make sure you check out this story about a collection which categorizes the many kinds of animals found in the Fay photos. Recently members of the Google Earth Community (including myself) have found places where several hundred photos taken in a single flight by Michael Fay are actually included in Google Earth. These are not marked as part of the Megaflyover layer, but they are there nonetheless. Here are two paths of photos: one and two - posted by 'Hill'. If you zoom in along the path you will see dozens of the very high resolution photos taken by Michael Fay. Most of the photos show pretty barren terrain, but a few have hidden gems of animals, people, or buildings. See this collection of placemarks which actually highlights the more interesting ones in one of the paths. Make sure you double click on the placemarks to get flown in to see the full resolution. Ever wonder what would happen if you dug a hole straight through the Earth, where would you end up? Recently, Google Earth Community member 'KoflAIR' posted a simple little mashup for Google Earth which makes this possible! You simply load his network link , and zoom in to a place you want to dig. A "Dig Here" placemark will appear after a short pause. Double click the "Dig Here" icon and you will be flown to the other side of the Earth from that point. You may want to zoom back out to figure out where you ended up. Since the Earth is nearly 75% covered with water, don't be surprised if you end up in the sea. 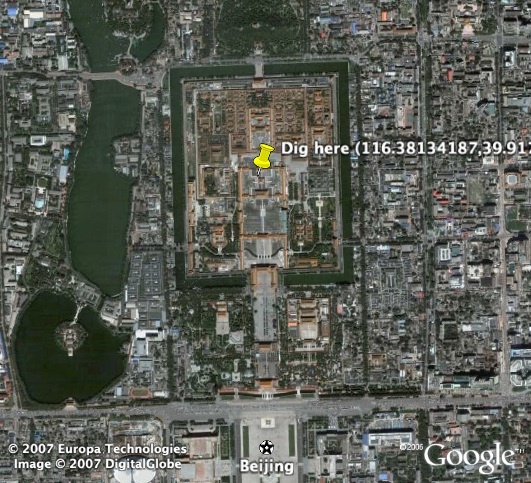 Interestingly, digging through the Earth from the Forbidden City in Beijing ends up in Argentina. Thanks for posting this 'KoflAIR'! When Google Maps mashups started appearing, it wasn't long before hole digging applications started appearing. Here is one example from last year called Earth as a Sandwich - which is probably one of the better maps versions. The Google Earth one is pretty cool though. Geograph.org.uk has a straightforward mission: "collect a geographically representative photograph for every square kilometre of the British Isles". This is not such a simple objective to accomplish. But, thanks to a free and open setup, the help of hundreds of photographers, and an interesting mission, they are well on their way to achieving their objective. Look at my previous article in October of 2005 and compare the map photos. The red represents the areas with photos. In fact, over 50% of their objective has been achieved - over 360,000 photos. That's a lot of photos! 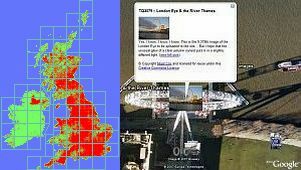 Barry Hunter has updated the network link to allow people to peruse the Geograph data inside Google Earth. This new layer is much superior because it takes advantage of GE 4's ability to show levels of detail (a feature in KML called "Regions"). As you zoom in, more information is pulled in. If you zoom in really close, it will load icons showing the photos themselves. (NOTE: once you see the camera icons, and zoom in closer - it may take a few seconds to load the photos). The screenshot here shows the London Eye. This is a very cool concept, and the network link really makes it easier to see the data. Here is the web page Barry prepared explaining the network link. Thanks Barry! 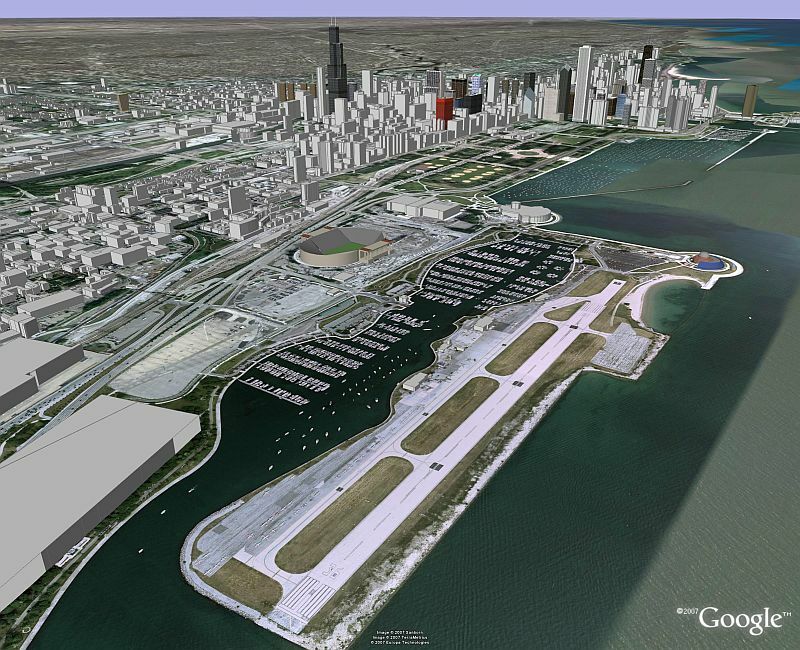 Meigs Field was a wonderful little airport near downtown Chicago - beloved to millions of Microsoft Flight Simulator users since it had been the default airport since the program was first released in the early-80s. Most aviators are quite familiar with the scandalous actions by Mayor Daley of Chicago who had long wanted to close this wonderful little airport. Starting in 1995, Mayor Daley had tried to arrange closing the airport so he could put a park in its place. In 2003, when it was apparent he was in for a long legal battle over the rights to close it, he hired a demolition crew to bulldoze the runway in the middle of the night - stranding 16 planes (which were later allowed to depart via the taxiway). The Mayor was breaking the law when he did this, but he managed to get away with only a minor penalty fee, and the city had to repay $1 Million of FAA money it improperly used to demolish the airport. Fortunately, you can still see the airport in operation inside Google Earth and Google Maps. Not only that, you can see it in Microsoft's Virtual Earth (or Live Local), and in Microsoft's Flight Simulator. I'm hoping Microsoft and Google will continue to show the runway even though it has now been turned into a park. At least we can keep Mayor Daley from the satisfaction of seeing his new park in these popular applications. Ask.com's aerial map unfortunately shows the new park. Read more about Meigs at Wikipedia (which recounts the actions by Daley in more detail). Also, check out the Friends of Meigs Field web site - they are still trying to get the field turned back into an airport. News Roundup - Version stats, KML Editors, GooPs, Hey What's That? 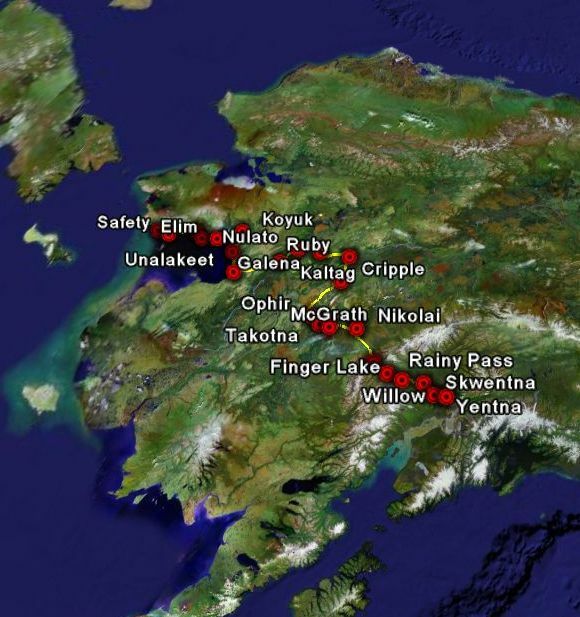 KML Editors - OgleEarth highlights the availability of two new KML editors. GooPs - Probably the best software for tying a GPS to Google Earth in real-time is this freely available donation-ware called GooPs. GooPs just got a big boost because a review of GooPs was just featured at LifeHacker here. Hey What's That? - I was going to write a story on this yesterday, but OgleEarth did a really nice review. Hey What's That? is a cool site that lets you generate a terrain panorama for any given spot (in the US only at this point). You can then view that panorama on their web site, and/or compare it to Google Earth views. The panorama views are annotated with Mountain names (many of which you can also view in GE by turning on the "Geographic Features" layer). It's definitely worth a look. Thanks to Michael Kosowsky for contacting me about it. Read the review. After seeing the gCensus application, GEC member 'Forkboy2' (who recently released a Google Earth network link of many maps he has done) decided he would do some GE visualization with historical census data. He started with US census data from 1790 (7 MBytes). This file contains graphic overlays showing by county US total population, Total slave population, "white" population, "non-white" population, etc. If you hold down the CTRL key on your key board and double click on a county, it will bring up a placemark description giving you more details. He has just today released the census data for 1800 (4 MBytes) as well. It's interesting to see most of the US population in the Boston area and Charleston. But, almost all the slaves are located near Charleston during this time period. The author of gCensus, Imran Haque, is a PhD student in Computer Science at Stanford University. He contacted me back in late February that he had released a subset of three states of many kinds of visualization using US Census data and Google Earth. But, he only had space for three states (California, Pennsylvania, and Oregon) since the dataset is so large. You can visit his web site for background information and try the application here (it starts with you selecting the data through a web interface). Once you select the location and information you want, his application builds a Google Earth file that lets you visualize the data in an informative way inside Google Earth. This is GIS visualization without having to buy GIS software. There is a large amount of data in the census database. This is a valuable resource for those wanting to understand things based on the census data. I waited to write a story about his collection hoping he would soon get more states up. Well, in the meantime he apparently won a contest with ExtremeTech who gave him a huge boost in publicity. You can read an article they asked him to write which gives more information about the project. He subsequently got Slashdotted and Dugg. Imran has now received a donation of more hard drive space so he can host more states. Hopefully he will soon have more states available with gCensus. I guess I missed out on a big scoop. Great work Imran! 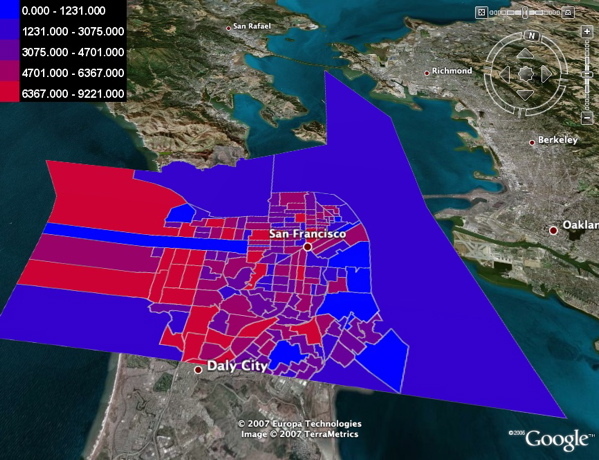 See another example of census data visualization in Google Earth. Google has given a big boost to the new layers added over the weekend to Google Earth. In particular, the new layers under "Featured Content->Global Awareness" each get their own write-up at the Official Google Blog. First, the Appalachian Mountain Top Removal layer gets a write-up by Appalachian Voice Executive Director Mary Anne Hitt. This new layer shows the destructive new mining techniques in practice by coal mining companies in West Virginia where they have removed the tops of mountains to get to the coal and minerals. These mountains were off the beaten path from towns and highways, so unless you saw them from above you wouldn't know about it. 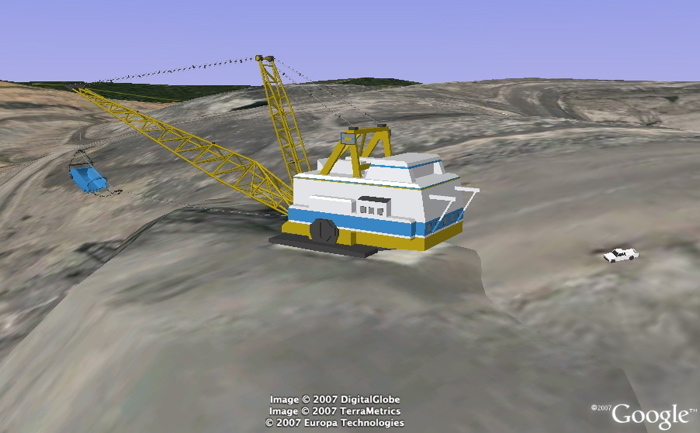 By the way, this layer has some hidden features like this 3D model of a piece of mining machinery called a "dragline" which scrapes the top of the mountain off. You can find it under the "Mining Tour" at "Stage 3". Second, the World Wildlife Fund Conservation Project layer gets a write-up on the Google Blog by James Leape, Director General, WWF International. 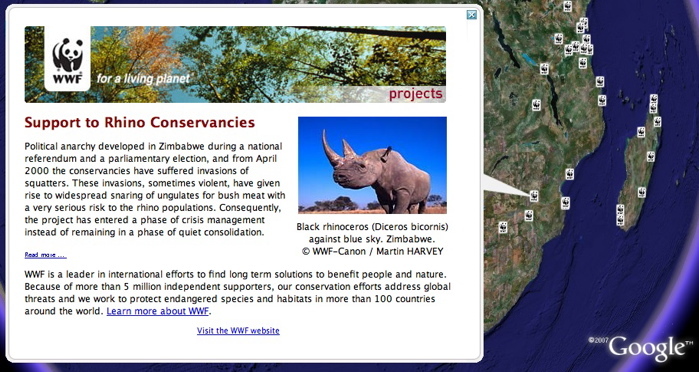 This layer contains placemarks marking the locations of the many WWF projects around the world drawing focus to endangered animals and the environment. Each placemark includes some background information on the project, photos of the endangered species or environmental feature, and links to more information at the WWF web site. A write-up on the official Google Blog combined with a layer in Google Earth will result in at least several hundred thousand page views, so this will really help these organizations out. 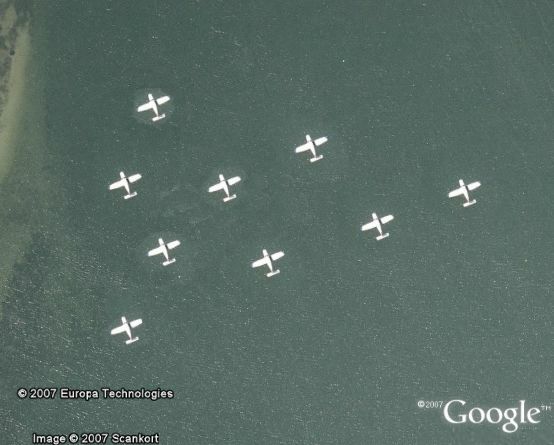 Nine Planes in Formation - Faked in the Google Earth Database! What started out looking like a pretty cool find of nine small planes in flight in near-perfect formation, was quickly determined to be a fake. At a lake about 35 km west of Copenhagen, someone photoshopped this formation of what is apparently a single plane before the photos were supplied to Google. So, anyone can see the faked formation (at least until Google removes them). See the planes here in Google Earth , or here in Google Maps. If you look closely at the aerial photo you can easily see that the water around each plane is identical. It only took a couple of hours from the time someone posted the exciting find, for experienced GEC moderator 'Hill' to recognize it was fake and point it out. You can read the two nearly simultaneous threads of discussion here and here. Interesting to note that just to the southwest of the planes on the same lake is a large number "2" in orange. This looks like part of a number from a camera which took the aerial photograph, but wasn't properly edited out. When you have millions of photos from many suppliers, interesting things happen to the imagery. 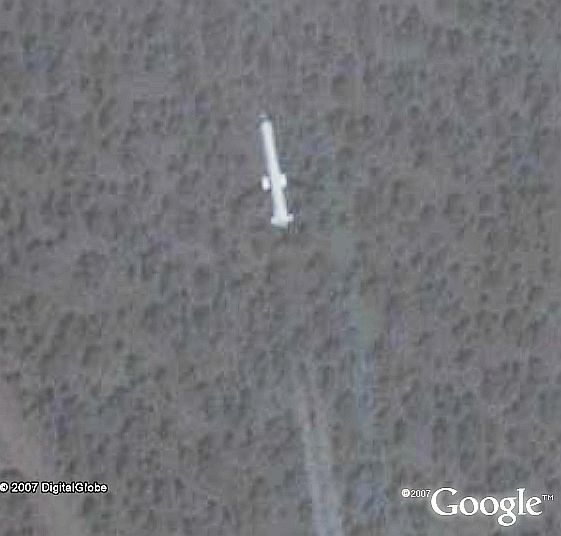 I kind of like the planes... Hopefully Google will keep them around a while. Thanks to 'Delta102' for the tip. For more interesting things found in the Google Earth imagery - which some people consider data errors, but others find entertaining - check out this article on the Data Error Compendium. Lloyd's has announced plans to offer agents and underwriters the means to see Lloyd’s data on Google Earth maps to plot their exposure to hurricanes, earthquakes, terrorist attacks and other catastrophes. The underwriters will be able to see specific visualizations for insurance exposure models related to catastrophes such as hurricanes, earthquakes, etc. 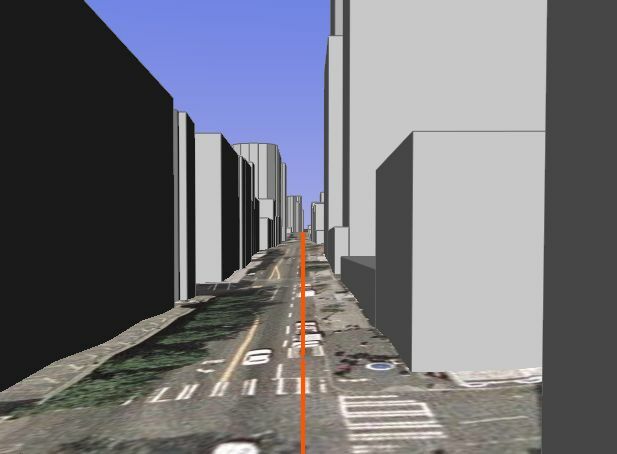 The application uses Google Earth's 3D abilities to make the visualizations more compelling by using techniques such as 3D bar charts overlayed over the specific locations of interest. “It should give underwriters increased confidence that they’re not going to be caught out by a hotspot." says Paul Nunn, Lloyd’s head of exposure management. “It’s early stages yet, but what we have seen so far is promising. “This tool provides a way of presenting a significant amount of relevant information about exposures in a way that’s clear and instructive and quickly highlights potential problem areas. The Cricket World Cup 2007 venues are located in the West Indies of the Caribbean. The Radioactive Yak has posted a Google Earth collection of placemarks showing the location of these venues. You can select the folder called "World Cup 2007 Venues" and then select the menu choice "Tools->Play Tour" to see a flying tour of the different cricket stadiums set up for this year's events. Many of the stadiums have been upgraded for this year's event, so the photos you see in Google Earth are the way the stadiums used to look a year or more ago. Some of the locations don't even have a high resolution yet. Although, none of the Caribbean had high resolution photos until less than a year ago - so what you see now is actually a big improvement. And, I think Google is the only mapping tool publicly available, at the moment, with high resolution photos for the Caribbean. Read the Yak's post for other World Cup information including Google Maps, and Google Calendar tools for following the games. 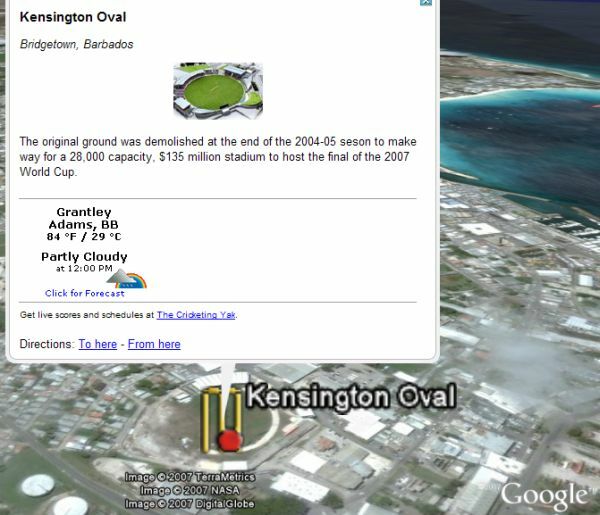 Radioactive Yak last May posted other Cricket Stadium locations for Google Earth. Google Earth Community (GEC) member 'giasen', who produced the cool-looking world oil consumption charts last month, has now used his exploding 3D shape charts technique to show US migration patterns . 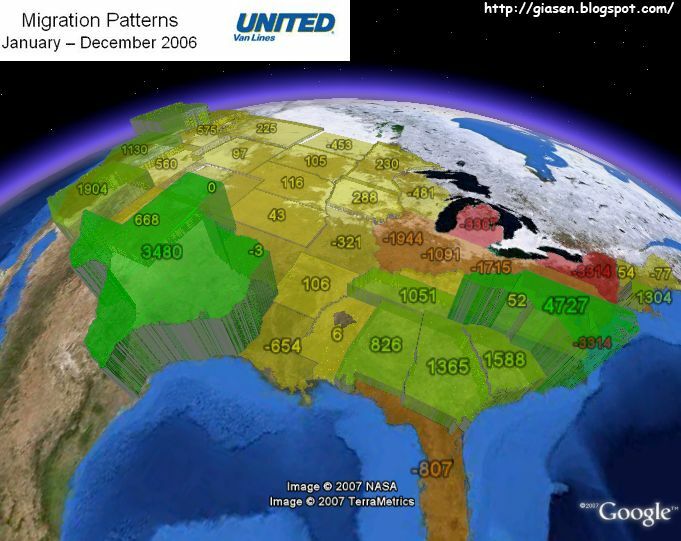 Taking data from moving company United Van Lines for 2006, he shows for each state of the US "inbound shipments minus outbound shipments multiplied by 100 in meters" (negative values are shown as flat). I was only somewhat surprised to find out that the state I live in, North Carolina, had the most number of people moving to it. It's just unfortunate so many people have found out how nice it is to live here. Here's his post. This interesting find by GEC member 'Joerg_M', who posted it last June, shows a car tipped on its side in a parking lot in northwest Germany. What is it about people parking in this part of the world? It wasn't long ago we found a car parked on the side of a building in the Netherlands. Is there a gravitational anomaly in this part of the world? One member in the forums speculated the car on its side was a new form of "cow tipping". Maybe like "tractor tipping" as seen in the movie "Cars"? Appalachian Mountaintop Removal - Part of this one was written about here before. Now substantially upgraded and includes overlays showing the mountains before the awful mountain top removal mining efforts. New Zealand Roads - Like Australia last month, now New Zealand has detailed roads and highways. New National Geographic content (under the "Featured Content". Now articles from National Geographic for Australia, New Zealand, Oceania, and the Poles. Under "Google Earth Community->Community Showcase->World Wide Panorama" - this excellent layer has been expanded to show many more panoramas. Each placemark contains a small snapshot which is a link to a Quicktime VR panorama - beautiful pictures! In a way, this "mashup" could facilitate a kind of pseudo "virtual world" application if you add Avatars. But, it won't make Google Earth into a Second Life. I'm going to have to try this out using the SpaceNavigator to see if the program will smoothly show the same movements to someone on the other end. It just occurred to me that this could be a great way to have someone else control a demo of Google Earth while you are giving a presentation, but where you could still have control as well. Thanks to Digital Urban for posting about the video. The Berlin collection is even better than the Denver and Las Vegas collections I demonstrated a few days ago. Read my story from yesterday for details on the Berlin collection or just download the link to see the buildings yourself inside Google Earth 4. These large collections of 3D models can demand a lot of resources. You should have a relatively new computer and/or a fast video graphic card (with lots of memory) if you want to see faster performance. In my video, I'm using a relatively new computer designed for 3D gaming. Related: See also the video demo of the Swiss Alps. Winter time in the northern hemisphere is almost over. That means its time for the dog-sled racing competitions! This year we have the two biggest races covered in Google Earth. 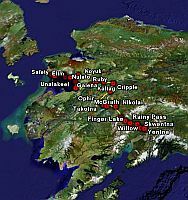 Iditarod 2007 - Matt Nolan has again contacted me to let me know about this year's 1100 mile Iditarod dog race in Alaska. Visit the official site for details. Matt has a web page dedicated to his virtual globe content for the race including a Google Earth file which shows the race track and checkpoints, weather, and live tracking of the racers. The race has already started, so check it out now. Finnmarksløpet - This is Europe's longest sled-dog race and has been held since 1981. The staff has, along with the NRK - Norwegian National TV, traced the route and added photos and information about each checkpoint. The 1000 km race starts this Saturday (March 10th) at 1145 local time. Here is the main web site. Here is the race course and checkpoints in Google Earth. They say there will be live coverage at the NRK site, it's not clear to me whether you will be able to follow racer positions with Google Earth. Several German readers have sent me E-mail this morning alerting me to the release of 44,000 buildings of Berlin (about 10% of the buildings in Berlin) for Google Earth. Not only that, but five of the buildings are available in the "highest resolution" with even interior details including the Reichstag Building (seat of the German Parliament), and the Olympic Stadium. The models were made possible with help by Hasso Plattner Institute in Potsdam and a spin-off called 3D Geo GmbH. It was developed by the State of Berlin through the Senate Department of Urban Development, the Senate Department for Economics, Technology, and Women's Affairs, and Berlin Partner GmbH. To download the collection (not yet part of the Google Earth layers), use this link (English) or this link (German). 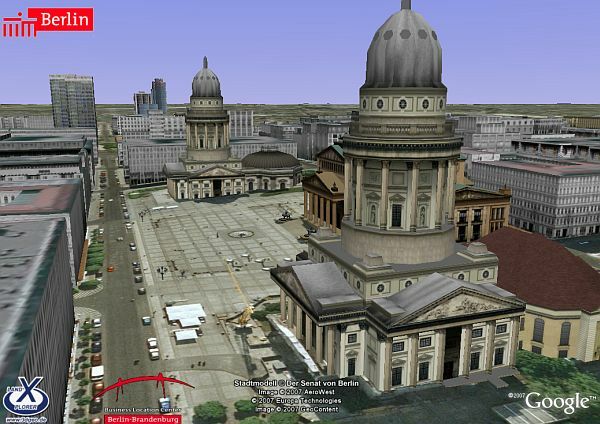 These models are not yet part of the Google Earth layers, you have to download them through these links published by the State of Berlin. There may be problems reaching the models today since it was just released and there will be high demand for this large collection of 3D models. More details on the release are available from here. Also here is a Spiegel Online article (in German). Thanks to GEB readers Frederic, Mathias, and Manuel for being the first (all within 30 minutes) of telling me about the new collection. SAN FRANCISCO- Online search leader Google Inc. has won a key court ruling in a patent dispute over its popular three-dimensional software that provides Internet tours of the Earth. In a summary judgment issued Wednesday, U.S. District Judge Douglas Woodlock in Massachusetts decided that Google Earth doesn't infringe on a patent issued to Skyline Software Systems Inc. in 2002. Skyline, a privately held company in Chantilly, Va., had been pursuing a patent infringement claim since 2004 when it first sued Keyhole Inc., whose technology powers Google Earth. Mountain View-based Google bought Keyhole for an undisclosed amount in October 2004. Keyhole's 3-D technology powers mapping software that ranks among Google's biggest successes outside of its search engine. Google said its Earth software has been downloaded more than 100 million times. Skyline had been seeking unspecified damages as well as a court order to prevent Google from using the technology allegedly covered by U.S. Patent No. 6,496,189. "From the beginning, we felt confident that Google Earth's technology does not infringe Skyline's patent," Google spokesman Ricardo Reyes said Wednesday. Skyline didn't immediately return phone messages seeking comment late Wednesday. Google Earth Resume/CV - A young man by the name of Ozgur Alaz in Istanbul has used Google Earth to generate a major marketing coup to further his career. He posted a GE file showing some placemarks of relevant locations to his personal and career life with the label: "The First Resume in Google Earth". His blog post has been picked up in the blogosphere and even some news sites and is showing signs it will get him some major global exposure. You can see his Google Earth resume here . I think he had a great idea, and although I don't think he is really the first to use GE this way, he is certainly the first to market himself with it. His blog is all about marketing by the way. By the way, I think this is an example of a professional YouTube video done as a commercial, but designed for the Internet. I wonder if they will even bother with a television broadcast? Residents in Germany have discovered there are some legacy label issues with the "Geographic Features" layer in Google Earth. 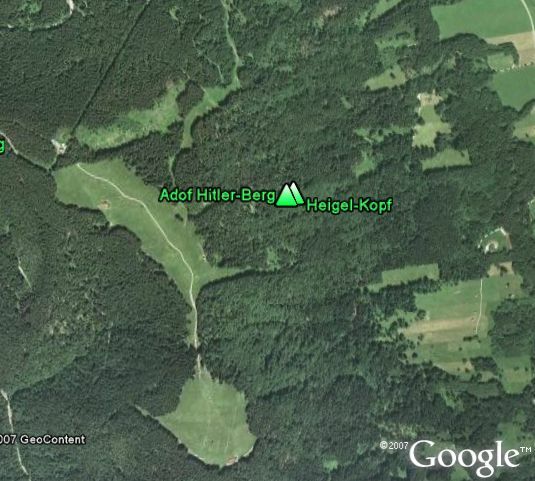 Spiegel Online (in German) reports that apparently someone noticed a mountain was labeled "Adof Hitler-Berg". The Nazi-era names like this were purged from Germany's maps and databases after the war. But, apparently some of the US databases still have the old names. According to a 64 year-old resident of the area, the mountain has not had the old name for as long as he can remember. A representative from Google says in the article that the label will be fixed with the next update to the layers in about 2 weeks. You can see the bad label here , by turning on the "Geographic Features" layer (if Google hasn't already changed it). In Google's defense, they have a huge challenge in gathering data describing virtually everything on Earth, processing terabytes of information, and attempting to avoid volatile issues (e.g. border disputes). Language translation issues make it even more difficult. I think the main point here is that Google is sharing the data, and if they discover issues they should address it as quickly as they can. If you see something in the default layers of Google Earth which is incorrect, you can report the problem at the Data Discussions forum. Thanks to GEB reader Frederic for the tip on this story. It has been several months since I made significant changes to Google Earth Blog's links page. I've added a table of contents, reorganized, and cleaned up the links a bit. The page includes all kinds of interesting web sites or blogs about Google Earth and related information. Included are links for getting started with Google Earth, advanced reference sites, blogs, sightseeing, geospatial tools and software, games, and more. A couple of days ago, a Google Earth Community member called 'Forkboy2' made an awesome post of a network link which will provide access to hundreds of maps on his Topographical Maps Archive web site. These maps were designed for use with Google Earth 4 (like the Rumsey Historical Maps collection) and will load higher resolution data as you zoom in closer (a feature in GE's KML called Regions). Once you load the network link find it under your "Temporary Places" with the label "Topo Map Archive AIO" and turn it on. This will load the contents. Then open the various folders to find the maps you would like to try. Make sure you turn off each map before loading another one so they don't overlay each other. 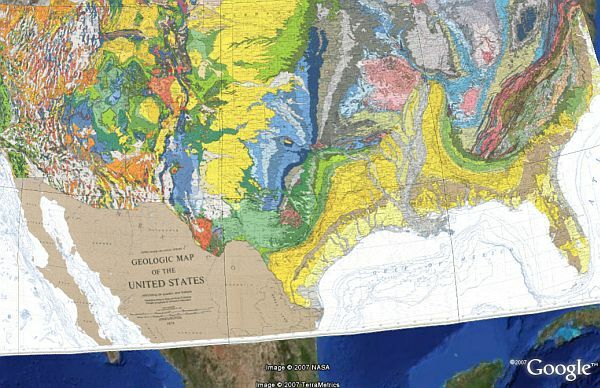 The map shown in the screenshot is the "Geologic Map of the US" (which you can load here directly ). One of my favorites is the historical map of the Lewis and Clark Trail which was taken from Lewis' original map in the early 1800s. Compare the original map to the real Lewis and Clark trail (more detail on this file here). The historical map was pretty accurate considering the lack of modern cartographical tools like GPS and satellites! There are all kinds of maps included in this collection including topographical maps, aeronautical charts, geological, historical, and even planetary map overlays. Apparently, some or all of these maps were converted for viewing in GE 4 using a software tool called SuperOverlay by Valery Hronusov. This is an excellent collection and I will probably highlight some others in future blog entries. Great work Matt (aka Forkboy2)! 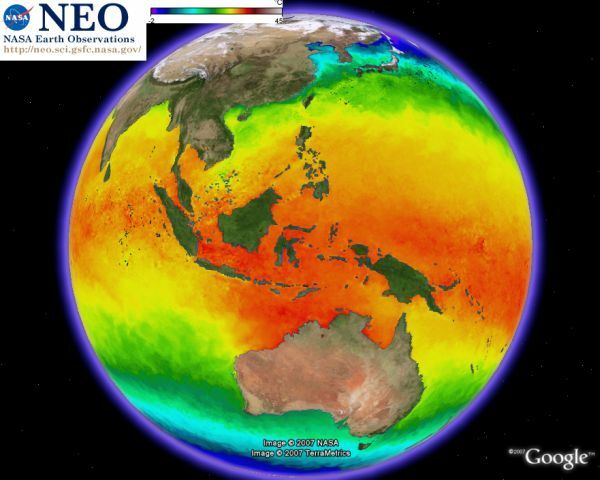 El Centro Nacional de Datos de Nieve y Hielo (NSIDC) es parte de la Universidad de Colorado y está afiliado con el NOAA. En Abril pasado el NSIDC (por sus siglas en inglés) lanzó una colección para Google Earth mostrando ejemplos de derretimientos de glaciares a través de su ubicación en GE y la visualización de pares de fotos de hace unos años comparadas con la actualidad. Con el creciente interés sobre el hielo y las regiones polares de la Tierra (y desde el comienzo del Año Polar Internacional), el NSIDC ha lanzado algún contenido para GE. Tienen una página web dedicada al contenido para GE sobre nieve y hielo, así como también una sección de "Datos Destacados". Uno de esos contenidos es una colección que muestra el hielo sobre el mar creciendo y achicándose a través del tiempo en ambos polos. Descarguen el archivo de Hielo Marino , e inmediatamente verán una "animación" mostrando la extensión de hielo alrededor de los polos durante los meses de Septiembre de 1979 hasta el 2006. Una línea púrpura muestra la extensión media para este período de tiempo. 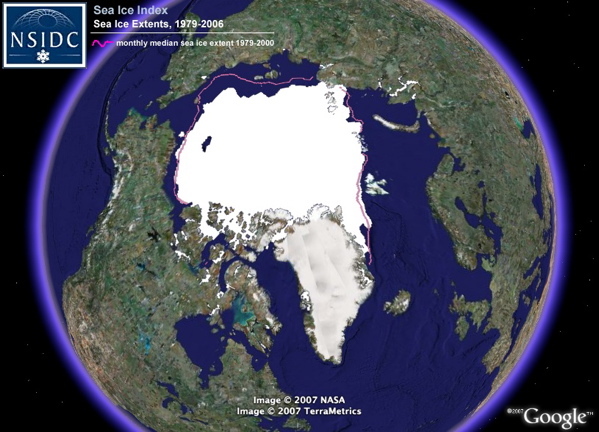 Si miran en la carpeta del NSIDC en Lugares Temporarios, pueden desactivar el "September Arctic Minimum" y activar el "March Arctic Maximum", o el "Monthly Sea Ice Extent" (Extensión Mensual de Hielo). También se destaca una colección que muestra los lugares de glaciares y fotos de más de 3.000 de ellos, 1880 presentes. Descarguen la colección de fotos aquí . Desde una perspectiva técnica, sentía curiosidad sobre esta animación implementada por el NSIDC ya que no eligieron la característica de GE 4 de animación del tiempo para la colección "Hielo Marino". En su lugar utilizan una técnica de actualización de KML que descargan 1 imagen cada 3 segundos desde su servidor. Creo que quisieron que este archivo funcionara también en GE 3. No sé realmente cuándo fué agregado este contenido pero yo leí sobre él via OgleEarth. KML Standardization - A good summary of Google's efforts to introduce KML to the Open Geospatial Consortium (OGC) standardization process. AllPointsBlog gets the details from OGC's Carl Reed who explains in an OGC mailing list about Google's submittal and what it means. Cruise ship tracker - Another cruise ship tracker called Seascanner for Google Earth has been released. This one also lets you see the position of the cruise ships and if you click on their position placemark you can see onboard webcams. Here is the web site with details on each of the ships tracked. Also see the other cruise ship tracker. IGiGLE - Irongeek's WiGLE WiFi Database to Google Earth Client for Wardrive Mapping. Read the details including how it works, and how to install and use it. Open source. 3D Printer - A Swedish design company used Google Earth and SketchUp to design and build a 3D model of Stockholm. They then used a 3D printer from Dimension to print a physical model of the city for display purposes. Here's the press release. 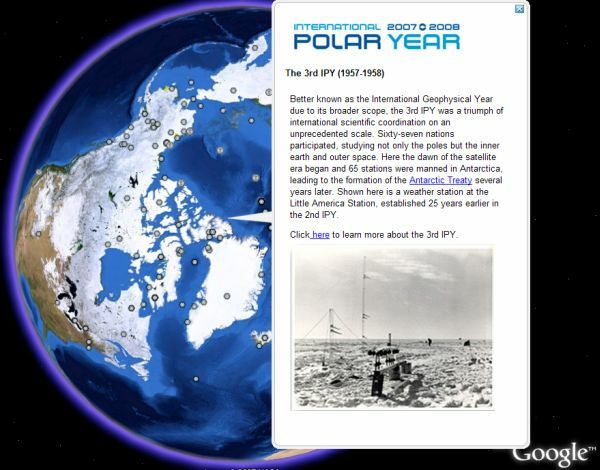 El Año Polar Internacional (IPY por sus siglas en inglés) es un gran programa científico enfocado en el Artico y la Antártida desde Marzo 2007 hasta Marzo 2009. Para tener una cobertura total y pareja de ambos polos, el API 2007 - 8 cubre dos ciclos anuales completos. El programa consta de más de 200 proyectos, con miles de científicos de más de 60 naciones examinando un amplio rango de temas físicos, biológicos y sociales. El API arrancó el 1 de Marzo con una cantidad de eventos científicos y educativos. Por ejemplo, escuelas de todos el mundo destacaron ese día lanzando un "mundo virtual". Básicamente esto es poner una marca en una mashup de Mapas Google echa por Tagzania - lean cómo participar aquí. Pueden ver los globos en GE aquí . Más importante aún, desde una perspectiva de Google Earth, Matt Nolan (el estimado investigador geofísico de la Universidad de Alaska en Fairbanks - y creador de EarthSlot) ha organizado una extensa presentación en GE del IPY que incluye viajes educacionales a los polos, un resumen sobre el API y muchas cosas más. Montones de fotos interesantes e información hay en las marcas de posición y vínculos con más información sobre el API desde los globos de descripción. ¡Gran trabajo Matt y el Equipo del API! On Wednesday, Google released high resolution terrain for the Swiss Alps, and new high resolution imagery for Google Earth. The Swiss Alps are really beautiful to view in GE yourself, but I occasionally like to show YouTube video demos for 3D content like this. As I was considering my approach, my friend Scott Madry (the Armchair Archaeologist) sent me a link to a cool video showing a real-life jet pilot taking off and flying through famous places in the Swiss Alps. At this point, I had to do the geeky thing and see if I could make the same flight sequences in Google Earth! So, I spent all day trying to coerce the "G-Force" mode in Google Earth to fly in a rough approximation to this military pilot (not easy at all!). The main point here is that the GE terrain looks VERY close to the real thing. Anyway, you can watch the real video on the top, and my video below using Google Earth. If you play both at the same time you can see I managed to get them to play close to in sequence (you might want to turn off the audio on mine since it's just a crude mono-copy of the sound from the original). Some notes: Google's imagery of the alps is summertime, but the jet video was in the winter. It took me like 50 tries to get the upside down turn over Mont Blanc with the mouse-based G-Force interface and no throttle control. The meticulous among you will notice other little flaws in my flying, but hey - it was only 8 hours worth of trial and error! Hope you guys like it. Digg it!